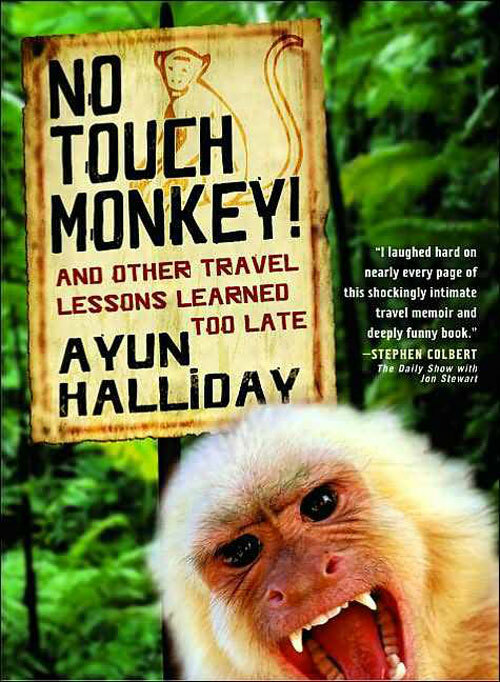 Ayun Halliday's No Touch Monkey is a collection of travel stories which reveal much more about the traveler than about the places she visits. This is more memoir than travel writing in my opinion. The majority of the book seems intent on telling stories which reveal Halliday's liberality. Halliday travles the world according to Lonely Planet on a Shoestring Budget. She longs for authenticity, sniffing disdainfully at the fake backpackers, those staying in nice hotels with tour guides and bottled Evian. She, and various boyfriends, sleep in dingy hostels and B&Bs, go for extended periods of time without bathing, and feast on sugar packets. What I was most impressed by was her tenacity. When her knee goes out, she doesn't jump the first plane out of Sumatra. She powers through malaria and stomach "issues" for which there is no truly descriptive, appropriate word. And she does it all - at least in the book - with a light-hearted, partial whine, self-deprecating outlook. The book was definitely humorous; although for me it was more a smile than a belly laugh. I was least impressed by the lack of details for a traveler. While I can remember many, many anecdotes, I can't necessarily remember where they took place as the setting was quite often irrelevant. Much more detail is given to her hippie-alterna-chick wardrobe, beliefs, desires, and Birkenstocks. I would have liked a bit more on where she was, rather than so much of...well, her. That is just expectation though. When I read a travel book, I expect to learn a bit more about the location, the culture, than was offered in this book. And here for the first time, another review I found of this book. Hopefully, the author won't mind. If you have reviewed this book and would like me to include a link to your site, please let me know in the comments. Job Hopper: The Checkered Career of a Down-Market Dilettante) and had much the same reaction as you -- too much about her and not as much about what I was expecting the book to be about. Her titles seem so promising but don't totally deliver. After reading the Job Hopper one, I decided not to read another book by her -- though the title of "No Touch Monkey" seemed promising. Now I don't think I'll bother!! Good job! And I hope your future "chance" readings work out a bit better! I almost picked up this book t'other day. Now, I'm quite happy that I didn't... when I pick up a book on 'travel writing', I expect it to focus more on the place, or the adventures at the place. Jenners - Glad to see I wasn't the only one. Sorry it took so long to respond; I've been wacky this past month. Cookie - I agree completely. There certainly were adventures, but they seemed rather self-centric rather than focused on the area.